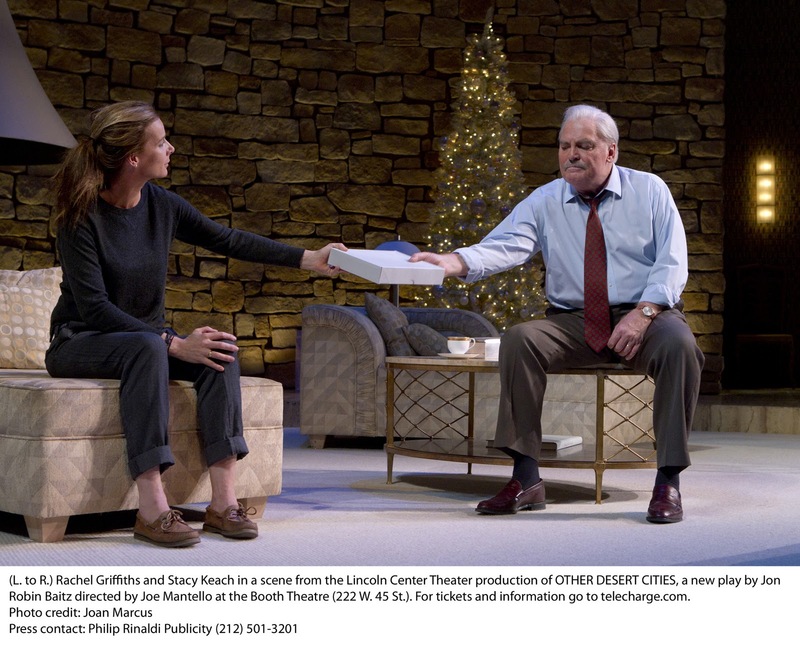 Long-hidden family secrets are revealed in Jon Robin Baitz's powerful Other Desert Cites, now on Broadway at the Booth Theatre. Christmas 2004, Palm Springs, CA. Arch-conservatives and Hollywood elite Lyman and Polly Wyeth (Stacy Keach, Stockard Channing), he a retired actor and U.S. Ambassador, she a former screenwriter, are welcoming their producer son Trip (Thomas Sadoski) and novelist daughter Brooke (Rachel Griffiths) home for the holidays. This is the first time East Coaster Brooke has returned for Christmas in six years, having previously suffered a complete nervous breakdown. (She now struggles with severe depression.) Brooke is also still trying to come to terms with the suicide of her older brother Henry more than 30 years earlier, at the height of the Viet Nam War protests. At the time of his death, Henry was wanted for questioning in the bombing of an Army Recruiting Center. 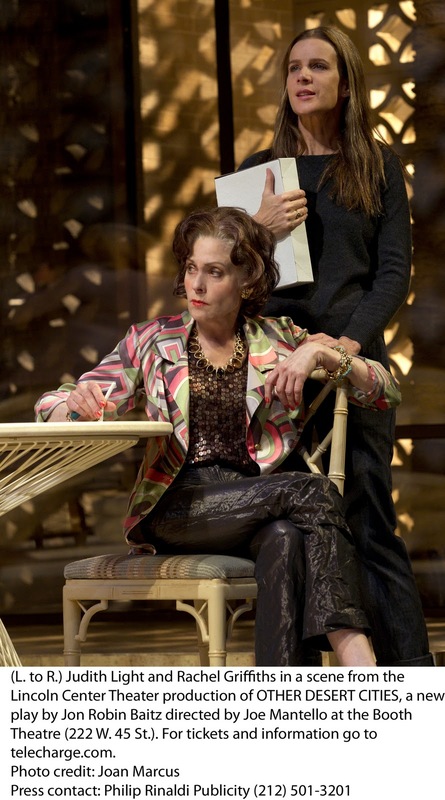 The final member of the Wyeth family is Polly's sister Silda (Judith Light), a recovering alcoholic, now living with Polly and Lyman after her latest stint in rehab. Silda is also the political polar opposite of Polly and Lyman. As the family tries to coexist with one another, Lyman playing peacemaker and Trip trying to stop to all political discussions before they start, Brooke reveals the topic of her latest book: a memoir about Henry and her childhood as she remembers it. However when the book turns out to be more of a "gotcha" blame game over her parents' role in what actually happened to her brother; with perhaps a bit too much input from Silda, whose memories from that time are particularly slanted, a family showdown looms over Polly and Lyman's reactions. Underneath all the political verbiage (with discussions covering everything from Ronald and Nancy Regan to the situation in Iraq) is the continual realization, expressed by more than one person, that there are always consequences to one's actions. 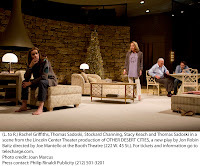 Eschewing conservative or liberal bashing per se, Baitz instead crafts some very powerfully layered characters, all of whom seem to firmly believe in their point of view. Where any particular audience member happens to stand on the political spectrum is not as important as the underlying tale of what happened long ago that serves to hold one's interest and makes the characters so identifiable. 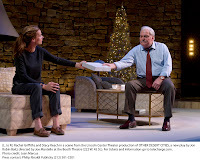 The playwright also mixes in a nice amount of humor into the story, with one-liners and putdowns coming thick and fast-usually from Polly or Silda. Channing is wonderful as Polly, a woman of steel who always has to be in control of any situation and who protects Lyman like a tiger guarding her cub. Her character is poised, plain-speaking, sarcastic and always pushing her children (especially Brooke) to do better in their lives. Polly is also not one to back away from a fight, no matter how personal the cost. Griffiths is excellent as Brooke, the catalyst and lynchpin to the story. A woman determined to expose the truth as she sees it, so she can finally begin to heal. Yet at the same time, Brooke is still seeking her family's approval, via Polly and Lyman's blessing to go ahead with the book, which Brooke already knows on some level they will not accept. It's this needy, almost cloying at times attitude, coupled with a strong independent streak that makes the character of Brooke so appealing. Joe Mantello guides the show with a firm directorial hand, slowly mixing together the different elements the script provides and surreptitiously bringing them all to a boil. The transfer to Broadway has also served the production nicely, with some minor tweaks and changes throughout giving the piece a better polish and more visceral tone overall. John Lee Beatty's set of the Wyeth home is very good, though upon closer inspection one can notice things that are just a bit off, such as the interior entranceway to the house being a bit incongruous with the rest of the domicile, showing perhaps that Polly and Lyman are not what they seem to be. The lighting by Kevin Posner and sound by Jill BC DuBoff work fine, as do the costumes by David Zinn; especially the outfits worn by Light, Channing and Keach, all of which have an appropriately comfortable look to them. 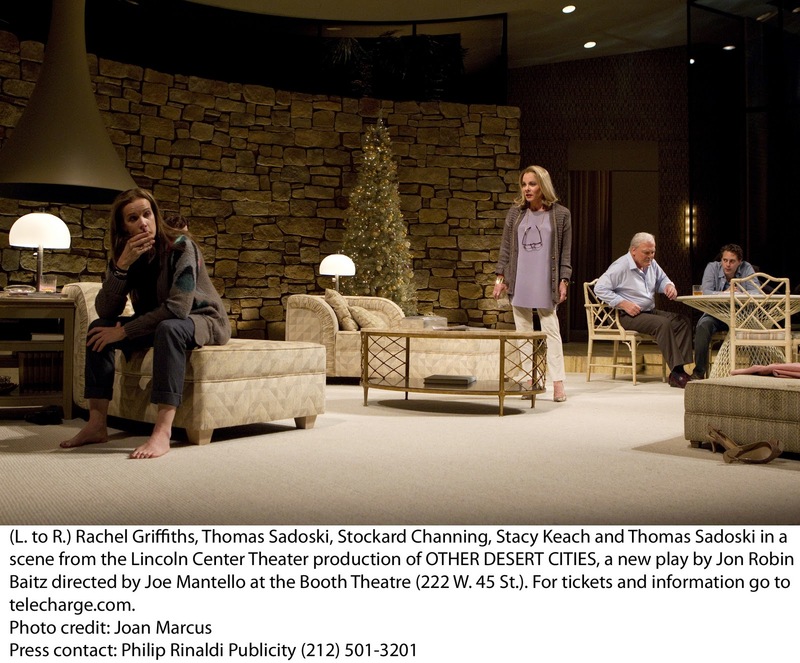 Other Desert Cities is a tightly-woven story of one family wresting with the memory of an incident long past, one which may forever change their future. Both funny and touching, the play is a powerful piece about love, loyalty, trust and consequences -- consequences both obvious and unforeseen.